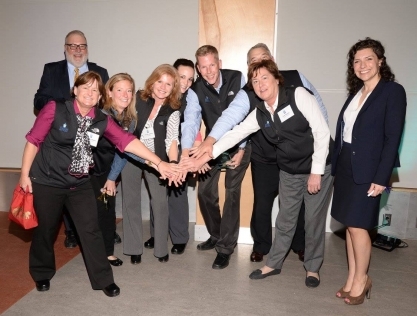 Union Mutual is proud to announce it was recently named one of the 2016 Best Places to Work in Vermont. This is the third consecutive year that the Company has received this award. Union Mutual is a property-casualty insurance carrier that has been dedicated to the greater Vermont community for over 140 years, providing outstanding customer service and a challenging, spirited work environment to its highly engaged employees. Union Mutual offers a professional work environment, competitive salaries and a comprehensive benefit package that goes well beyond the expected. The 10th annual list of the Best Places to Work in Vermont was created by Vermont Business Magazine, the Vermont Chamber of Commerce, the Vermont Department of Economic Development, the Vermont Department of Labor, the Society for Human Resource Management (SHRM) – Vermont State Council and Best Companies Group. The final rankings for each category were announced at a special awards presentation on March 31, 2016 at the ECHO Lake Aquarium and Science Center.